The Kirkland Museum is reopening in the Golden Triangle in fall 2017. Civic Center Station is undergoing a $26 million overhaul. CU Denver's Student Wellness Center is expected to open in early 2018. The property languished as a parking lot before becoming 1401 Lawrence. The 50-room Ramble Hotel will open in RiNo in late 2017. Cattivella will anchor Stapleton's Eastbridge project. The 318,000-square-foot office building opens in early 2017. Sanderson Apartments will be the largest supportive housing project for the Mental Health Center of Denver. Alamo Drafthouse will bring eight movie screens to West Colfax Avenue. The new configuration of the Space Theatre reduces seating by 134. 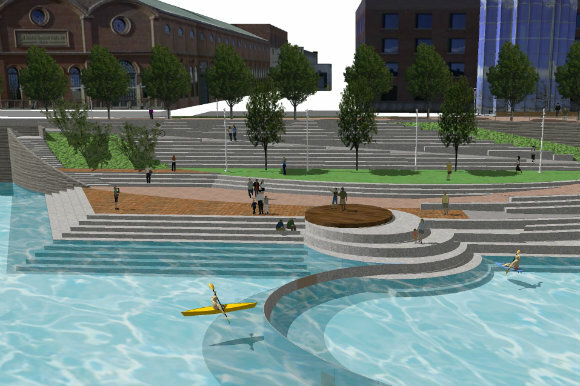 After a delay, the new Confluence Park will be ready by fall 2017. 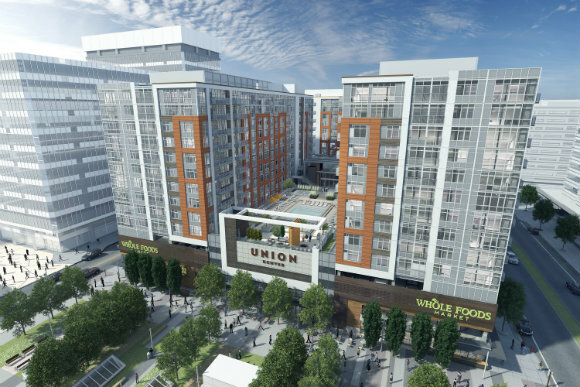 Union Denver will bring Whole Foods to LoDo. Cranes dot Denver's skyline, and workers wearing bright yellow vests and hardhats direct traffic around streets and sidewalks blocked by construction projects. That construction is booming in Denver is evident, and while it may seem like most of the projects are apartments, there are a number in the works that will improve the fabric of the neighborhoods they're being built in. Here are the 12 most-anticipated projects that will be completed in Denver in the coming year. Set to open in fall 2017 in its new location in the Golden Triangle, the 38,500-square-foot Kirkland Museum of Fine & Decorative Art will have about 65 percent more display space for the three collections it houses. "We are so excited to share the new Kirkland Museum of Fine & Decorative Art with visitors," says Maya Wright, the Kirkland's communications manager and historian. "Our new building will offer an enhanced experience while staying true to the salon style and intimate atmosphere for which the Kirkland is known. 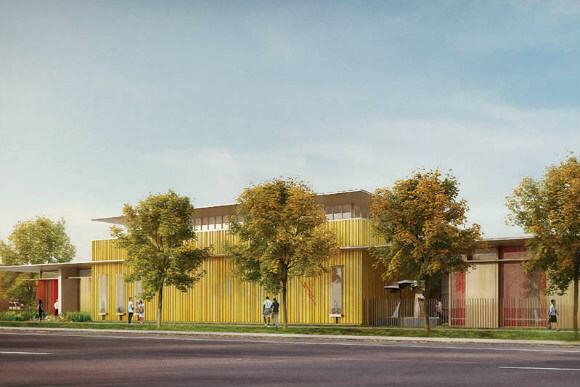 The expanded space at the museum's new location provides far greater visibility for the museum's three collections and will make it even more convenient for art lovers to experience all the internationally important artwork Denver offers in the Golden Triangle." The project also includes relocating Vance Kirkland's 1910-1911 Art School & Studio building to the new location at 1201 Bannock St. The core and shell of the One Belleview Station will be completed in early December, with the first tenant moving into the 318,000-square-foot office building at Interstate 25 and East Belleview Avenue in Jan. 2017. Regional accounting firm Eide Bailly will occupy the entire seventh floor -- 29,704 square feet -- in the 15-story building. Broker Ryan Stout of Cushman & Wakefield says he's getting close to signing a high-end restaurant for the ground floor, as well as several other office tenants. "The activity has been great," Stout says. A joint venture between Prime West and Goldman Sachs, One Belleview Station will include four levels of parking, as well as immediate access to light rail and bus transit. The building lobby will feature a touch-screen directory providing information for the light-rail schedule, restaurant and hotel locations and weather, in addition to tenant information. The building is part of Belleview Station, a 42-acre master-planned transit-oriented development campus that will have more than 2.2 million square feet of office space, 250,000 square feet of retail, 2,000 apartments and condominiums, two full-service hotels and more than 5 acres of plazas and open space. 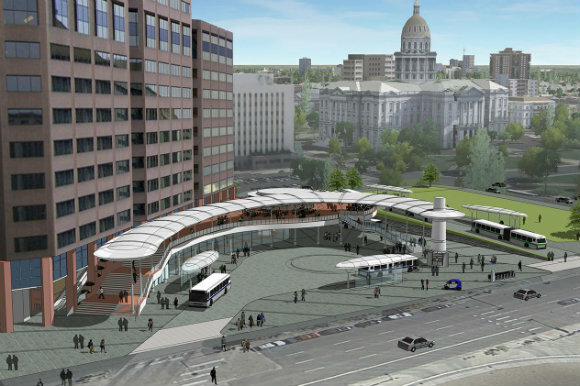 The Regional Transportation District's $26 million renovation of Civic Center Station at Broadway and Colfax Avenue will be completed next fall. "The construction continues, with site demolition currently in progress," says Julia Marvin, a spokeswoman for RTD. "The existing RTD Sales Outlet has been relocated to Lincoln Street for the remainder of the project." The renovations include nine bus bays, a glass-enclosed terminal building, a rebuild of the bus concourse, an extension of the bus ramp connecting Broadway and Lincoln Street and a busing structure that is easier to maintain and repair. There's also a land parcel available for future development. The 30-year-old Civic Center station serves 18 routes and has an average of 15,000 passengers daily. The 30-year-old station also serves as the end of the line for the 16th Street MallRide and MetroRide. 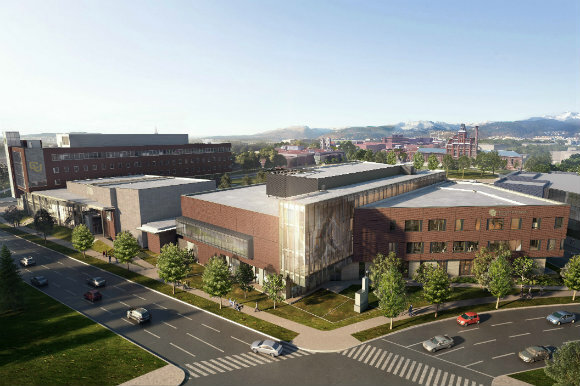 Saunders Construction broke ground in September on the Student Wellness Center at The University of Colorado Denver on the Auraria Higher Education Campus. The project, expected to open in early 2018, will fill the daily leisure needs of students on the campus with a focus on inclusiveness and holistic wellness. The building will include student lounges, space for group study, gaming, rooms for reflection, seminar rooms, a small student health clinic and a student kitchen. The Student Wellness Center will work in tandem with the Student Commons Building to create a courtyard that activates the student experience along 12th Street. Activity spaces include fitness spaces for free weights, selectorized equipment, cardio and group exercise studios. A two-court gymnasium will allow for intramurals in a variety of sports and activities and will support special events with retractable bleacher seating. A six-lane lap pool will provide a variety of aquatic programming, and a third gymnasium will allow for greater flexibility and a home for CU Denver Club Sports. Outdoor programming includes a home for outdoor pursuits where students can rent outdoor equipment and take guided trips, a bike repair shop and a climbing wall. Designed by Anderson Mason Dale Architects in partnership with SmithGroup JJR, the project will be seeking LEED certification. After 12 years as executive chef of Panzano, award-winning Denver chef Elise Wiggins is opening Cattivella in Stapleton early next year. "Brick by brick it's coming along," Wiggins says. "We have some delays because of permitting. We were slated for the third week of December, but now it's looking more like January or February." 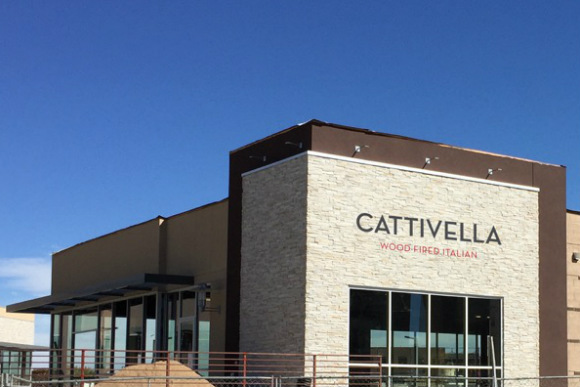 Cattivella, which translates to "naughty girl," will serve up wood-fired Italian from its space on the southwest corner of Martin Luther King Boulevard and Galena Street in the Eastbridge project, which abuts the long-awaited King Soopers currently under construction. Glass walls have been installed. Large doors -- 8 feet wide and 13 feet tall -- will open onto the patio, and a garage door will connect to the bar. Designed by Sarah Brown of Semple Brown Design, an exhibition kitchen will be the star of the show and focus all attention to a wood-burning pizza oven, a wood-burning grill and the dance of the Cattivella cooks. Guests can also sit overlooking the pastificio (pasta table) section of the chefs' counter, while others might sit with a view of the Butchers' Corner where butchers work on beef, pork, lamb and other whole animals. 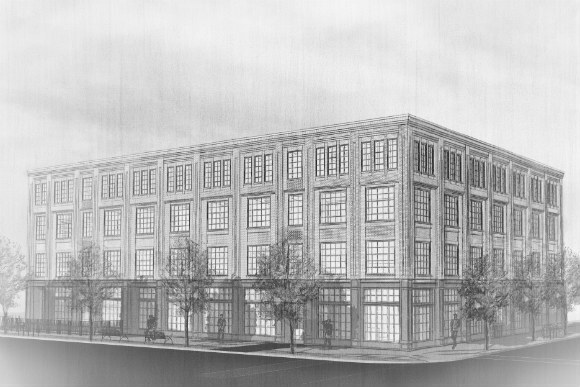 A 50-room boutique hotel at 2450 Larimer St. in River North is expected to open late next year. The Ramble Hotel will feature Death & Co Denver as its marquee lobby bar -- the first outpost outside of the bar's original location in New York's East Village. The hotel will include an intimate theater and bar; flexible meeting space; a small retail outlet and an outdoor courtyard. "Small urban infill lots like ours, which is 12,500 square feet, always take a while to get out of the ground," says Ryan Diggins, a partner in Gravitas Development Group, which is developing the property. "But once the underground parking structure is complete, the visual progress will be noticeable. Our three-story concrete and steel building will start going vertical in early 2017, and we're hoping for heads on pillows in late 2017, early 2018." Designed by Denver's Johnson Nathan Strohe, with interiors by Los Angeles-based Avenue Interior Design, the hotel's 4,700-square-foot lobby with 20-foot ceilings takes inspiration from the French salons of the 17th century and the salon's utility in society as not only a platform for the exchange of ideas through conversation but as a catalyst to creating community. A decade ago, a 55-story luxury condominium tower was planned for 1401 Lawrence, but when the economy crashed, developer Great Gulf Corp. cancelled the project. 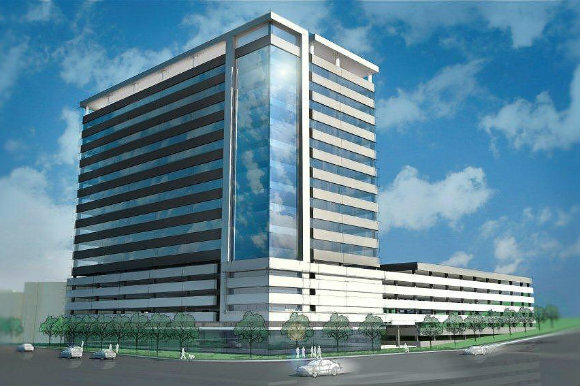 The property languished as a parking lot until two years ago when Great Gulf's commercial arm, First Gulf, broke ground on the recently opened 22-story office building, which was 70 percent leased when it opened this fall. Its anchor tenant is the Polsinelli law firm, which leased 86,000 square feet of the 300,000-square-foot building with an option to lease as much as 130,000 square feet. "It's been well-received by the community, and prospective tenants love it," says Jeff Castleton, executive managing director with Newmark Grubb Knight Frank, which is marketing the building. "The 14th Street location came into its own just as we started construction." 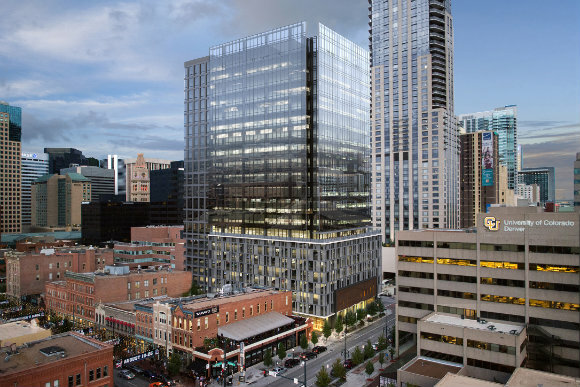 The Downtown Denver Business Improvement District partnered with property owners and the city on a $14 million streetscape project to enhance the pedestrian experience along 14th Street. The project included expanding sidewalks and adding a dedicated bike lane; improving pedestrian lighting and adding 12 wayfinding monuments; installing 33 benches, seat walls and custom-cut seat elements; and adding planters and planting 166 trees. 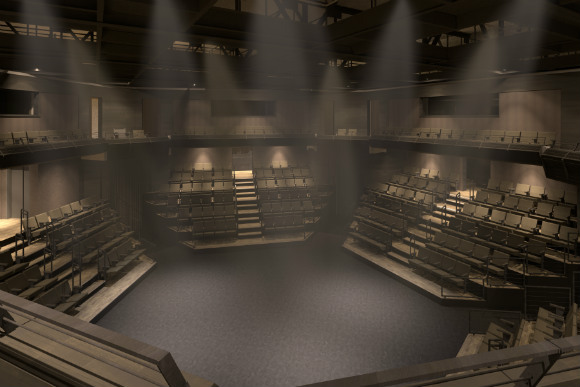 The Denver Center's Space Theatre has been completely gutted and will re-open as a five-sided, in-the-round performing arts space in fall 2017. Demolition is complete and concrete has been poured for the first balcony. Restaurant renovation also is underway. Though the project has had some updates over the years, the current renovation is the first overhaul of both audience amenities and backstage support. The old Space Theatre had four levels of seating. When the new theater is completed, there will be just two levels, greatly improvement sight lines for the audience. The 550-seat Space Theatre opened in 1979. While the number of seats on the main floor will be increased, the overall seating capacity will be reduced to 416. The project, made possible by a $10 million grant from the Better Denver Bond Program, also includes doubling the restroom capacity for both the Space and the nearby Stage Theatre. 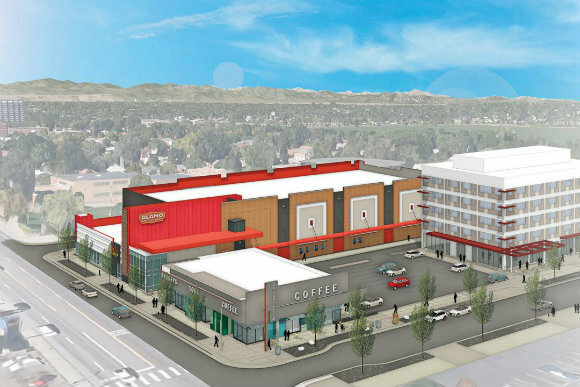 When Alamo Drafthouse opens in 2017 at SLOANS Denver, it will offer dinner, drinks, movies and events, all under one roof. Named "the best theater ever" by Time magazine, the eight-screen complex is under construction on West Colfax Avenue at Stuart Street on the site of the former St. Anthony's Hospital. "We are targeting to open at Sloan's Lake in May 2017," says Alexandra Griesmer, marketing specialist for Alamo Drafthouse. "We are excited to add a location in such a great neighborhood." Alamo offers casual dining options, as well as menu specials updated at least every three months. Cold beer and wines are on the menu at every location, with an emphasis on highlighting local breweries whenever possible. Come late 2017, downtown will be home to a 56,000-square-foot Whole Foods Market, which will open its doors in Union Denver, a mixed-use development with three residential towers and a total of 580 apartments. Whole Foods, which will be the company's flagship store in Denver, will offer expanded catering and delivery tailored to the downtown business community. The remaining 4,000 square feet of ground-floor retail will be dedicated to restaurants, bars and dry good stores that support the neighborhood. The three residential towers are 13 stories tall and offer studio, one- and two-bedroom apartments. The upper two levels will have penthouse apartments ranging in size from 1,000 to 3,000 square feet. The towers surround an outdoor courtyard with gathering spaces, whirlpools and a swimming pool. Adjacent to the courtyard, a large indoor amenity zone will house fitness spaces, community spaces, kitchens and bars, conference rooms and a business center. 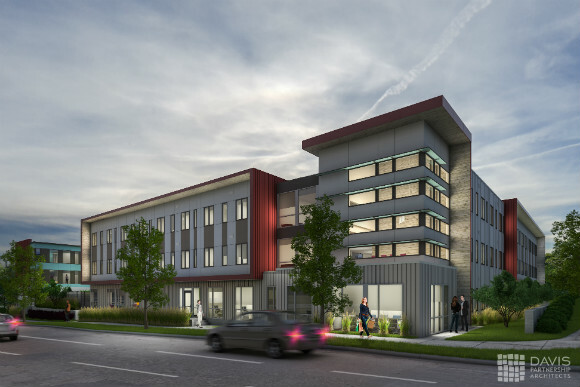 When Sanderson Apartments opens next summer at 1601 S. Federal Blvd., 60 chronically homeless people in Denver will have a place to call home. Modeled after successful permanent supportive housing projects in other U.S. cities, Sanderson will be the largest supportive housing project for the Mental Health Center of Denver, a nonprofit community mental health center that has been delivering comprehensive and accessible mental health and substance abuse treatment, housing, education and employment services to children, families and adults for more than 25 years. The three-story, 50,000-square-foot building will include 60 one-bedroom, furnished apartments with on-site staff and amenities. The project is part of the city's $8.6 million effort to provide housing for 250 people who are chronically homeless. It's partially funded through $600,000 in financing through the Denver Office of Economic Development. The rejuvenation of Denver's historic birthplace on the banks of the South Platte River is expected to be completed in August 2017 after stalling for more than a year when the contractor discovered coal tar buried at the river's edge. The Confluence Park project near REI's flagship store includes building a new plaza, installing ramps for the South Platte Trail, improving accessibility to the area and adding new landscaping. The revamp of Shoemaker Plaza is the first phase of the $42 million master plan vision for Confluence Park, which includes providing a walking path with seating areas and overlooks through a restored natural area between 15th and 19th streets parallel to the South Platte River Greenway; creating Denver's Beach at the confluence of the South Platte River and Cherry Creek; activating the park's edges with restaurants and businesses; and enhancing the ability for Confluence Park to host major outdoor events, festivals and competitions.